Things have been going rather slow on the blogging front ever since Lil L and I succumbed to the first chill of autumn. We're suffering a case of cabin fever if you don't count quick trips to the post office and grocery store. We've also been passing our germs back and forth between the two of us and avoiding our friends like the plague because none of them will thank us if their kids get sick. Believe it or not, ever since my first post about sweaters, I've learned an important lesson. I actually went ahead and ordered the Isabel Marant chunky Jemma sweater. Made of 100% thick cable knit merino wool, there was no doubt that I would be well insulated from the cold. Perhaps too well. I also looked like the Michelin man which ain't a good look when you're vertically challenged. I felt sweat oozing out from every pore in my body. Since I'm usually in and out of the house/train/school, I don't particularly want to perform a striptease act in front of innocent bystanders whenever I'm feeling hot. You know what I mean so get your dirty mind out of the gutters. I guess it's back to thinner layers. 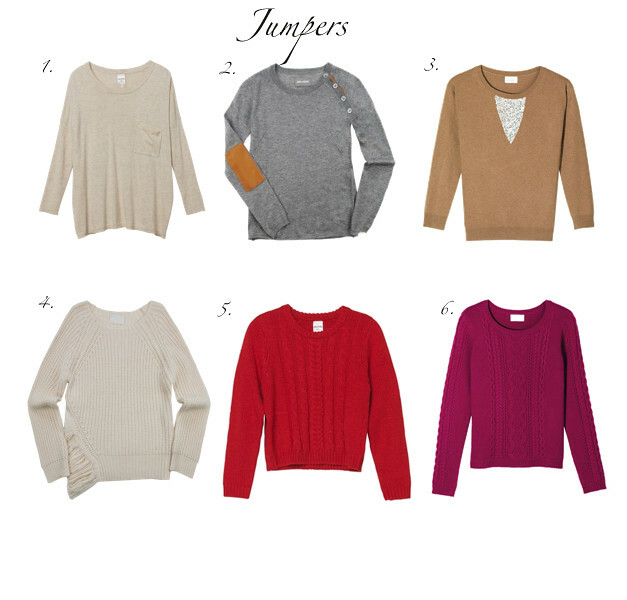 I'm a big fan of jumpers !! I'll never stop shopping them!!! I learned a very similar lesson -I LOVE huge chunky sweaters but now have to get them in deep v/scoopnecks so I don't take off my entire shirt when taking it off as well - so annoying! Mona, aren't those two divine? Lamia, I love the way you wear your jumpers! Kat, I know!!! The same thing happens to me each time I take off my sweater. Either I managed to take of my t-shirt or I managed to smear my lipstick and make up on the neckline. Love, love, love the Z&V one! But I can't buy ANOTHER gray sweater!! Kim, :P Unfortunately, it's so darn easy for me to look like the Michelin man. *sigh* If only I could grow a couple of inches. Sharon, hahahaha....so far I haven't had anyone commenting that I look pregnant but I don't want to chance it either. Thank you! Lil L and I are driving each other nuts being stuck at home for 3 days now. lauraloo, you and me both!! I have soooo many gray sweaters. I really need to deviate from that color. Love #2 Zadig et Voltaire jumper - the elbow patches got me! They are so cute!